Red blood cells (fancily known a erythrocytes) are the simple, non-nucleated cells that transport oxygen in the body. This just outlines their development in the bone marrow (hint, they start off with a nucleus) and the major growth factor erythropoietin that stimulates their production. By looking at the peripheral blood and bone marrow, you can work on sorting out where and what kind of disease process is going on. 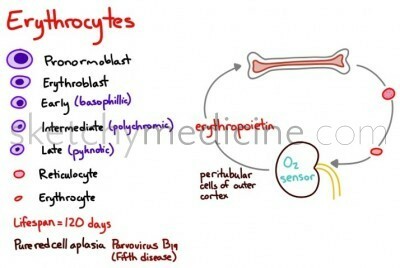 For example, if there are too many reticulocytes in the peripheral blood. This entry was posted in Heme and tagged Blood work, histology by Ali. Bookmark the permalink.